Hand made custom terrariums, stained glass window planters, and flower vases with stained, and leaded glass, working in the Tiffany tradition. 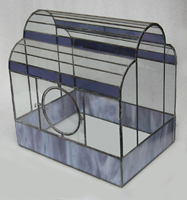 All my work is original in design, and combines glass with nature. Anything you order is an original design made by me, I have no employees so my production is limited. It is good to order early to allow enough time for me to make and ship your order. In this world of instant gratification, and overnight express, I know it is difficult to wait, but your patience will be rewarded by knowing that this is something special....made especially for you. For those who have a deadline approaching or need a gift on short notice, this Idea may be the answer. 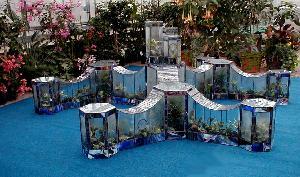 Note: There are so called, Imported Bargain Terrariums. on the market. Though less expensive, they are not watertight, have metal frames which can rust, and need to be assembled by inserting loose glass panels into the frame. 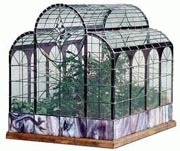 All of my terrariums are watertight, the frames will not rust, and soil and plants can be placed directly inside, with no worries..